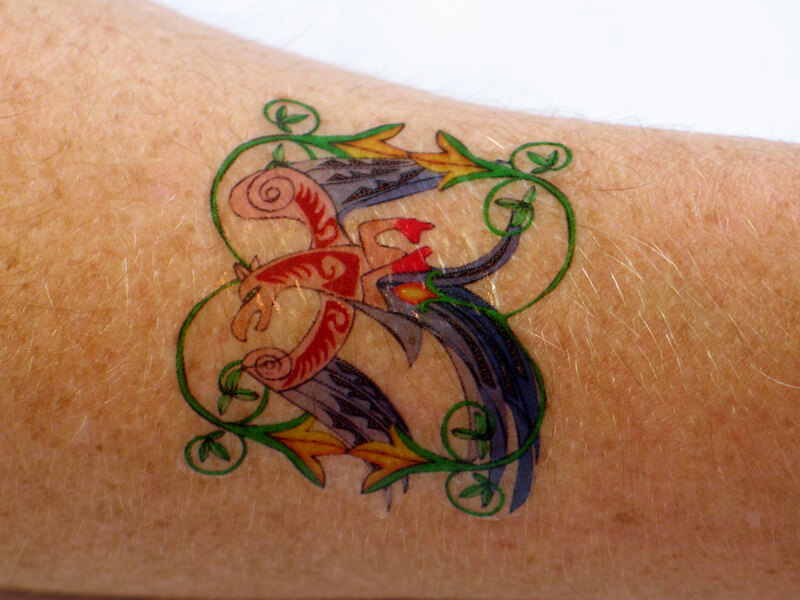 Make your own Tattoos using your inkjet or laser printer. Have you always fancied having a tattoo but didn’t want to have to go through the pain of having one done. Now you can have as many painless tattoos as you like by just using your inkjet or laser printer. Print off any designs on to the special tattoo paper including photos or even your own drawings and transfer them to any body part in minutes. The tattoo paper is so easy to use and tattoos can easily last for up to a week before they wash off. You can mix and match designs and even have a different tattoo every week of the year! Children and teenagers love making their own tattoos. We sell many packs to the younger generation and find that many Europeans are buying from our website. Crafty Computer Paper is the only company to sell this kind of tattoo paper in the UK. It comes in a set of two sheets. The first set you print off using your inkjet or laser printer and the second sheet is an adhesive sheet to apply to the surface of the printed tattoo sheet. Cut out the designs then peel off a thin protective sheet from the tattoo surface. You are left with a sticky image, place this face down onto the skin and rub. Next take a damp cloth and dampen the back of the tattoo paper with water, after about 30 seconds the second protective sheet will slip off revealing your tattoo. If you don’t like it at this stage you can easily peel it off. If it is just what you want leave it to dry for a few minutes and it will be there until you wash it off with hot soapy water and a scrubber. The tattoo paper has many uses and many different kinds of people have a use for it. Kids love it and one customer told us she used it at a school fete as a fundraiser. She printed out quite a few designs which would appeal to boys and girls and then charged 50p per tattoo. The kids thought this was great and in no time at all many had tattoos all up their arms much to the displeasure of their parents. Teenagers can make their own designs to match an outfit or just try out a tattoo before they commit to the real thing. Businesses use the tattoo paper to help with their promotions; one company bought the tattoo paper to stick on peoples foreheads advertising their brand. This paper is great fun and easy to use, anybody can have a go and get a perfect result every time. This press release was distributed by ResponseSource Press Release Wire on behalf of Crafty Computer Paper Ltd in the following categories: Children & Teenagers, Leisure & Hobbies, Retail & Fashion, for more information visit https://pressreleasewire.responsesource.com/about.